Hi everyone! I have another simple nail art over another Girly Bits microglitter for you today. Clearly this is some sort of phase for me at the moment! I'm just loving this finish combined with girly accent nails. I absolutely love the glowing purple microglitters which stand out against the pink! This is not your average pink glitter polish at all. I used 2 coats for perfect coverage and opacity. The formula and application were really good. For the nail art, I freehanded some simple daisies on my thumb and ring fingernails using acrylic paint and a fine detail brush and added some dots with a dotting tool. I finished everything off with a coat of topcoat. If you use a thinner topcoat like I do you might want to use 2 coats for a totally smooth finish. Hi everyone! Today I have some delicate nail art over a gorgeous microglitter for you. This is Girly Bits No Such Thing As A Purple Problem. Pam describes this beauty as 'a grape purple jelly micro glitter with silver holo sparks, dark purple, copper and aqua shimmer'. I have to say this is one of the most beautiful polishes I have worn recently. I found myself staring at my nails! I used 2 coats of No Such Thing As A Purple Problem for perfect opacity. The formula is on the thicker side but still easy to apply and drying time is good. For my nail art, I freehanded some lace with acrylic paint and a fine detail brush on my thumb and ring fingernails. I then finished everything off with 2 coats of topcoat. I use a thinner topcoat (Revlon fast dry) and found that 2 coats were necessary for a smooth finish over the slightly gritty microglitter. You might be able to use only one coat with a topcoat such as Seche Vite or Poshé. Overall I loved how this mani turned out and was really sad to take it off! What do you think of it? Hi everyone! Today I have another swatch post for you. This gorgeous holographic was a custom polish from Darling Diva made for the We're All Darling Divas Facebook group. Violets are Blue is a stunning and vivid pink which pulls purple with blue flecks. It's a unique take on a pink holo for sure. I love this colour on my skin tone too. I used 2 coats of Violets are Blue and a coat of topcoat. As you can see, it is very holographic. Topcoat didn't dull it at all. The formula and application were great. As this was a group custom, it is no longer available to purchase but other Darling Diva Polishes can be purchased from the Darling Diva Big Cartel store and Llarowe. There are loads of stunning holos to choose from! You can also like the Darling Diva Facebook page to keep up with restock info and new releases! Hi everyone! 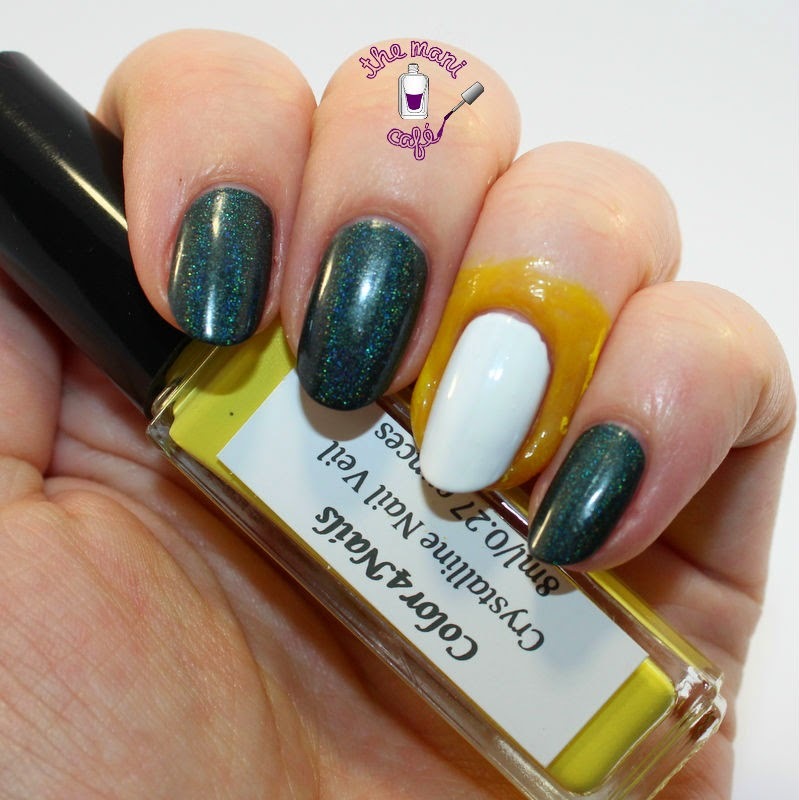 Today I have a stunning polish from Paint Box Polish to show you. This is Slightly Unstable from the Women of Harry Potter collection. I love Harry Potter and I think a collection based on the female characters is nothing short of genius! 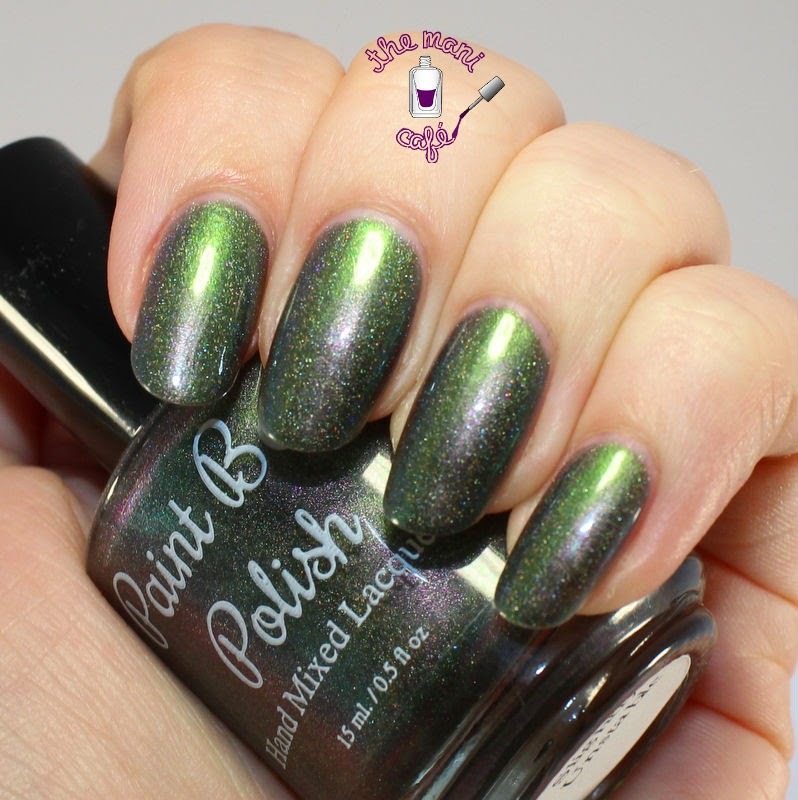 This beautiful green multichrome holographic is inspired by Bellatrix Lestrange. Despite her being so awful, she is one of my favourite characters, especially in the films. The name is so perfect too. She is definitely Slightly (a lot!) Unstable! I used 2 coats of Slightly Unstable for perfect opacity and the formula and application were great. I finished off with a coat of topcoat as always. I ended up wearing this plain and without nail art. It is so stunning and so different depending on the lighting you are in. I posted this pic on IG which shows this polish in a different light. I really love this polish and the brand in general. You can purchase Paint Box Polish from the Big Cartel Shop here. Follow Pam's blog for more info and just general awesomeness here. You can also like the brand on Facebook to keep up with releases etc. Hi everyone! Today I have some St Patrick's Day nail art for you. 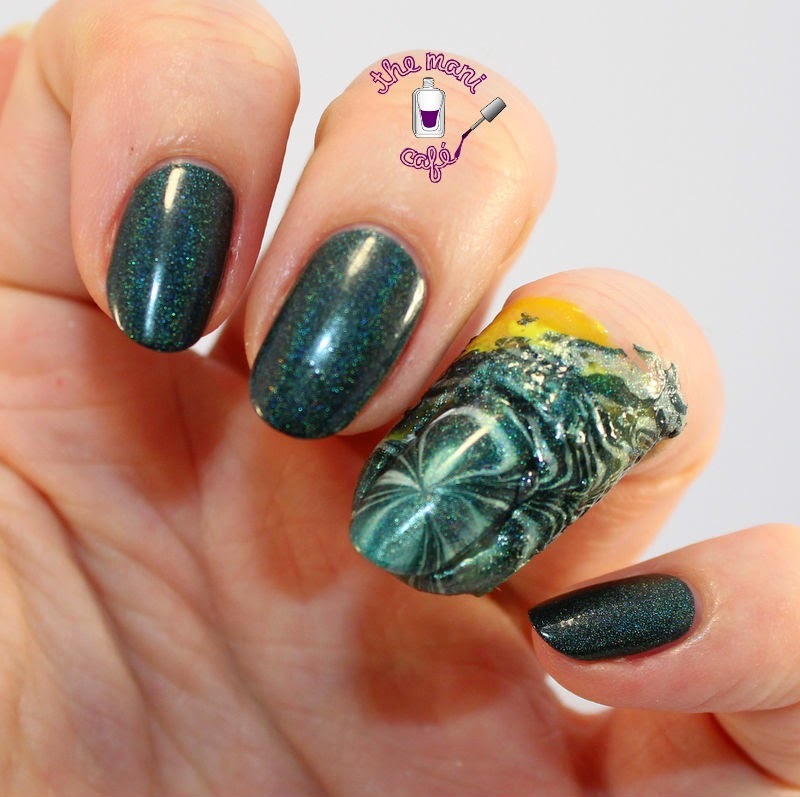 This is a subtle clover watermarble using the two holographic shades from the Shamrockin' collection from Superficially Colorful Lacquer. If you missed my swatches of this collection, you can check them out here. This manicure was also the occasion for me to try Color4Nails' Crystalline Nail Veil, a product designed to protect your skin when doing nail art. I usually use liquid artist's gum from the craft store for marbling or other messier nail art (gradients, stamping etc). To use the Crystalline Nail Veil you basically paint it around your nail covering as much skin as required for whatever you are doing, let it dry for a minute (it turns a darker yellow when dry), get on with your nail art, then peel it off! I started out my mani with 2 coats of Superficially Colorful Lacquer Stouting on all nails except my ring finger. For that one I did two coats of white (Sinful Colors Snow Me White). I then applied the Crystalline Nail Veil as you can see here. 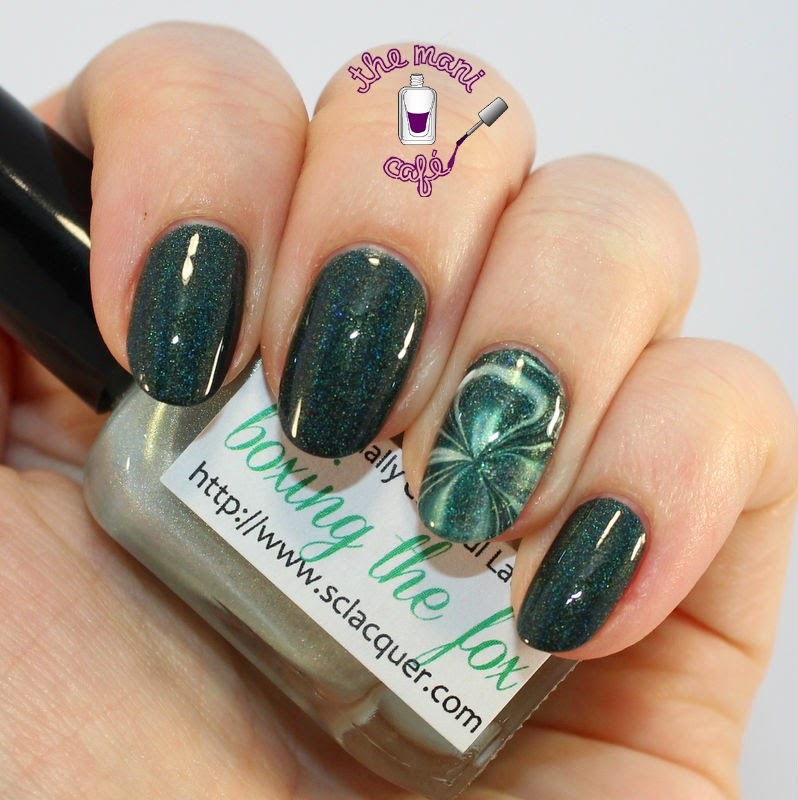 I used Stouting and Boxing The Fox (also from the SCLacquer Shamrockin' Collection) for the marble which is inspired by a four-leaf clover. These two colours worked brilliantly for marbling! I then removed the Nail Veil using tweezers to pull it off. I had very minimal cleaning left to do and it was much quicker than using tape or cleaning only with acetone for example. I finished everything off with a coat of topcoat! Overall, I would recommend the Color4Nails Crystalline Nail Veil. I can see myself using it often in place of my liquid artist's gum for smaller areas especially because of the convenient striper brush. Please note that this product does contain latex. It does also smell a bit unpleasant due to the latex but I'm used to the liquid artist's gum which is a bit similar so this is not something that bothers me too much. The easy clean-up is worth it! Color4Nails Crystalline Nail Veil can be purchased here (with international shipping available). It retails for 6 USD. Superficially Colorful Lacquer can be purchased from the Superficially Colorful site with worldwide shipping!